Video images of the third hurdle clearance by the finalists in the Menï¿½s 110 m hurdles at the United States Olympic Trials were recorded from 3 camera views. Temporal and kinematic variables were calculated from the film records for the 4 competitors whose hurdle clearances were unobscured out of the 8 competitors. The mean foot contact time during the take-off was .142 s and the average flight time was .317 s. The hurdlers increased their horizontal velocity of the CM during the take-off stride by 13 cmhsec-1 and they increased their horizontal velocity of the CM at landing by 84.8 cmhsec-1. The hurdler elevated their CM from the take-off by 11.6 cm during hurdle clearance and a peak rise of 14.7 cm for the bodyï¿½s CM was found at peak elevation. The apex of the flight trajectory occurred on the average 3.2 cm before the hurdle and the hurdler left the ground 224 cm before the hurdle and landed 143 cm behind the hurdle. Integrated multimedia analyses of their hurdling performances were presented at the USATF Elite hurdling development camp. METHODS: Video records of 8 Elite high hurdlers were taken at 60 Hz from two front right and sagittal perspectives as they cleared the third hurdle during the high hurdle finals of the 2000 United States Olympic Team Track and Field Trials (See Figure 1). Only 4 hurdlersï¿½ performances were digitized due to obscured views as the flight passed over the hurdle. Fourteen body data points, 6 hurdle points (right & left top, base, & standard base), and the fixed reference marker on the video images of the hurdle trials were digitized, the coordinate data were scaled using an 3-DLT transformation, and then smoothed using a quintic spline filter. To examine the relationships between horizontal force production, contact time, and flight time, the temporal variables of foot contact time during the stride prior to take-off and flight time were determined. Kinematic data included the changes in CM horizontal velocity during foot contact at take-off, changes in CM horizontal velocity at landing after hurdle clearance, vertical elevation of CM during hurdle clearance from take-off, and horizontal displacement of the CM apex in comparison to hurdle clearance position. Additionally, the displacement of the foot at take-off from the hurdle, and the displacement of the landing foot from the hurdle were determined (See Figure 2). Technique analysis of the video records were reviewed with the athlete, his coach, and a member of the United States of America Track and Field (USATF) Elite hurdling development staff, the next day after the competition. 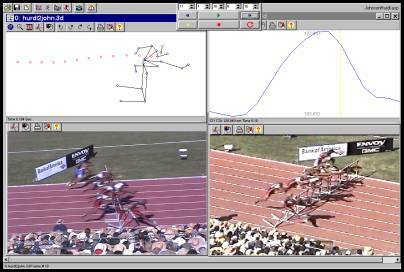 Subsequent analyses using data integration techniques of the hurdlerï¿½s video records, stick figure reconstruction with the CM traced, and the kinematic data graphs of their hurdling trials were generated. These integrated multimedia displays are to be provided to the athletes at the USATF Elite Hurdling Development camp to be held at the United States Olympic Committee Training facility in Chula Vista, California (See Figure 3). RESULTS AND DISCUSSION: Means and standard deviations of the temporal and kinematic data of the elite high hurdlersï¿½ performances at the 2000 United States Track and Field Olympic Team Trials were calculated and are presented in Table 1. The mean foot contact time calculated for the step going into the hurdle for this studyï¿½s elite high hurdlers were slightly faster than the 0.135 s contact times reported by R. Mann (1993) in the Elite Hurdler Project technical report. But these values were slightly slower than the .122s foot contact times for the American Elite hurdlers determined by Finch, Ariel & McNichols (2000). In the present study, the flight times were found to be similar to the .31 s flight times determined for the good elite hurdlers analyzed in the 1993 project and faster than the reported .366 s flight times determined at an American Elite Hurdling development camp. The shorter flight times may be attributable to the present studyï¿½s elite level of training and the competitive nature of the Olympic Trials. The high hurdlers elevated their CM approximately 11.6 cm at hurdle clearance above their CM position at take-off during the hurdling movement and they attained a peak CM height of 14.7 above their CM take-off position. The high hurdlersï¿½ horizontal displacements between the apex of the CM trajectory and the hurdle ranged from 34.9 cm in front of the hurdle to 38.8 cm after the hurdle. The hurdlersï¿½ mean horizontal displacement of the apex was 3.2 cm before the hurdle. Therefore some of the hurdlers need to work on their strides going to the hurdle and the CM projection trajectory, in order to make their CM flight trajectory apex coincide with the hurdle clearance position rather than in front. If this alignment of the trajectory peak was made then the hurdlers would not need to produce as great an elevation and shorter flight times would result. Only, one of the high hurdlersï¿½ CM peak trajectories coincided with the hurdle clearance. The hurdlersï¿½ average take-off distance was 224.6 cm and their landing distance was 143.8 cm. These displacements were very close to the 213 cm (7 ft) take-off and 122 cm (4 ft) landing displacements, that are typically discussed by hurdle coach clinicians. The alterations in the horizontal velocities of the CM during the take-off found that the high hurdlers increased their velocity by 13 cmhsec- 1 or approximately 1% of their running velocity. These accelerative changes in the horizontal velocities for the hurdlers would be indicative of an appropriate stride length foot at foot plant prior to take-off. During the landing phase, the hurdlers experienced an acceleration of 84 cmhsec-1 or about 7.6% of their running velocity, as they came over of the hurdle, which would be indicative of the hurdler landing in a tall running position rather than settling and retarding their running velocity. The application of greater horizontal forces would be indicated by shorter ground contact times and those horizontal forces may only be generated when the hurdler is contact on the ground, therefore long flight times while clearing the hurdle would not be beneficial in achieving fast hurdling times. The small vertical CM displacements observed for the hurdlers during hurdle clearance indicated that the hurdlers strode over the hurdle, thus reducing the flight time and increasing the acceleration of the body when in contact with the ground. CONCLUSIONS: The hurdlers experienced their greatest acceleration during the landing phase after the hurdle clearance than the step prior to take-off. Only one of the four hurdlersï¿½ apex of their CM flight trajectory occurred over the hurdle. The hurdlersï¿½ apex of their CM parabolic pathway should occur while clearing the hurdle. A horizontal displacement between the CM apex and the hurdle would be indicative of improper striding or flight trajectories, where the take-off step occurred too close or too far from the hurdle or they projected their body at an improper angle. An apex displacement would indicate that the hurdler reached his peak flight position either slightly before or after the hurdle. The simultaneous integration of video, stick figures and data was used as a visual coaching and research tool for performing a hurdle analysis and providing immediate feedback to the athlete and coach. Finch, A., Ariel, G., & McNichols, J. (2000). Integrated kinematic data analysis of American elite hurdlers. In: Proceedings of International Symposium on Biomechanics in Sports XVIII, The University of Hong Kong, Hong Kong, China. Mann, R. (1993). The mechanics of sprinting and hurdling. Elite Hurdler Project technical report. United States Track & Field Association, 1-135. McDonald, C., & Dapena, J. (1991). Linear kinematics of the menï¿½s 110-m and womenï¿½s 100-m hurdles races. Medicine & Science in Sports & Exercise, 23:1382-91.